Gertcha! 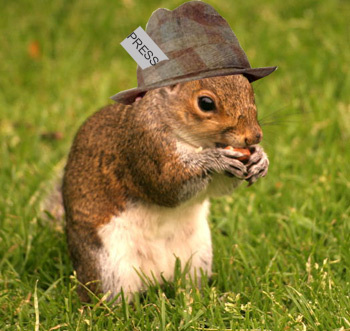 All the latest Hollywoodland gossip from Monkey Broth’s very own peeping tom rodent, Tabloid Squirrel…gertcha! I see them Hedgehog Twins have been out on the razz again this week. Your loyal servant Tabloid Squirrel CAUGHT up with a close friend of the stars who have featured in films such as Benjie’s Revenge and Why are you still bleeding Mr Robinson? to get the inside gen. By all accounts the twins, Debbie, 19 and Doris, 24 were partying the night away at exclusive club HERPES until well past their bedtime. The twinkle toed twins were spotted knocking back the rum and cokes before LEAVING with Hollywood A-lister Zac Backencrack. Daddy, multi-millionaire film producer Marvin T. Robot, won’t be a happy BUNNY reading this. My guess is that they will be in T-rouble when they finally crawl home! Meanwhile closer to home, it looks like the Krayfish brothers are in a right ol’ pickle with their dear departed marvvver, to whom they were so good while she was alive. Having escaped from prison just last week the boys are already turning their attentions to their next big scam – Scaletrix! Reggie Krayfish has already held high level talks with Hornby and their plans to make an autobiographical version of the popular kids’ toy are starting to take SHAPE. But their fledging business won’t please their poor departed ma. She was a MASSIVE fan of Buckaroo and her will stipulated that the lads could only depict their life of crime and violence through a game of luck and chance involving small plastic barrels, spades and saddlebags. Insiders reckon she has already VISITED the family home and ticked the boys off proper style during a recent SÉANCE. What the fack? And finally, Arctic terns are famous for undertaking the longest migration of any BIRD. Some individuals travel from the Arctic to the Antarctic and back again over the course of a year. Their migration means that they NEVER really have a winter – cos when the northern hemisphere experiences its winter months, the birds are in the southern hemisphere, and VICE versa. That’s a facking tern up for the books!